Nancy McMahon, DPT, the founder and president of Ascend Physical Therapy & Wellness, still remembers her first experience in a physical therapy clinic when she was growing up in Vienna, VA. “I was a 16-year-old basketball player and I hurt my knee really badly.” Nancy consulted a trusted coach and he suggested she try physical therapy before agreeing to surgery. Within a couple of months, she noticed great improvements with reduced pain and increased mobility. Nancy says her teen experience with the healing power of physical therapy convinced her of its value as a career. In the early years of her career, Nancy continued to explore a variety of clinics and gather practical knowledge about a variety of conditions treated with physical therapy. She worked in outpatient clinics, in hospitals, and served as a contractor physical therapist in schools and nursing homes gaining expertise in orthopedic, neurology, and pediatric physical therapy. She also gleaned extensive knowledge and training in anatomy, physiology, and the biomechanics of the body. Along the way Nancy fostered a dream to open her own physical therapy clinic that would take a holistic philosophy to treating the whole patient and work to prevent the reoccurrence of injury and pain. 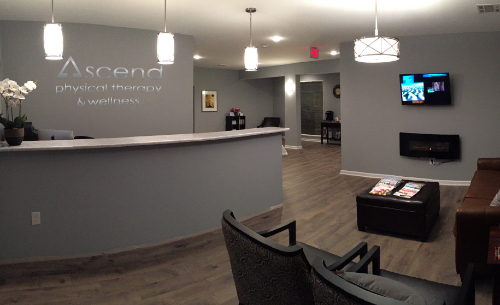 Ascend Physical Therapy & Wellness is the reality of that goal. Nancy is licensed as a physical therapist in Virginia, Maryland, and Florida. She is a certified wellness coach in Virginia and an active member of the American Physical Therapy Association. When she is not working, Nancy loves to travel to all parts of Virginia and abroad with her husband. She believes in living an active life and spends time hiking, biking and exercising. Petya enjoys sports and an energetic lifestyle, which is why she pursued a career that helps people stay active. Petya graduated with BS in kinesitherapy/physical therapy from National Sport Academy in her hometown Sofia, Bulgaria. She also earned a Doctorate Degree in Physical Therapy from Shenandoah University, VA.
Petya is particularly interested in treating orthopedic and sports related injuries. Before joining Ascend Physical Therapy & Wellness, Petya treated patients with variety of musculoskeletal and neuromuscular disorders. She is a member of the American Physical Therapy Association. When not working, Petya enjoys spending time with her husband and two young children as well as working out at the gym, running and swimming. I have seen many therapists over the years, but I was never truly satisfied with my treatments. That is why, after my knee replacement earlier this year, I searched for a new therapist. My search led me to Ascend. Wow! Ascend has been spectacular. Over the last several months, I have seen Nancy, Petya, and Cathy and they have all been fantastic. Every so often you meet someone who excels at their job and you realize it isn’t just their job, it’s their passion. That’s Nancy. She invests a part of herself with every patient, ensuring that they get the best possible treatment and stay well for years after that. I would recommend Ascend Physical Therapy to anyone looking for therapy from a knowledgable, skilled, and caring team. Petya was my therapist for several months - she is AWESOME! Every now and then you find a medical practice that is truly providing patient-centered care , not just a buzz word. That is the best thing about Ascend. Highly recommended. Nancy is an outstanding physical therapist with a wide range of skills and knowledge. She has been so skillful in helping me get back on my feet due to all her training.